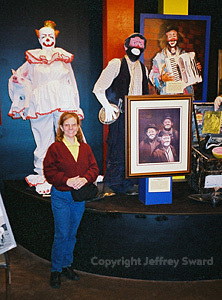 The Dwarf with the Otto Griebling and Felix Adler displays at the International Clown Hall of Fame, Milwaukee, Wisconsin. Tucked away in the Tommy G. Thompson Youth Center at the Wisconsin State Fair Park is the International Clown Hall of Fame. You may need to knock, as foot traffic often is low. Professional clowning is a serious business and takes a high degree of skill and dedication to be done well. The International Clown Hall of Fame honors those great clowns of the past with distinguished careers. Be sure to find the Otto Griebling display, pictured here. Visit the International Clown Hall of Fame Web Site.